I mean, I really have no idea. I eat chocolate and cheese together all the time (HOW WEIRD AM I? ), but I just really wanted to say those words. This is just the beginning of my roasted strawberry obsession. Believe it. Last week I made pancakes with them and I even made something savory and I am fully planning on blasting you in the face with my full-blown fascination until the point of complete annoyance. But not really. At all. Do you enjoy my use of super crusty (in a good way, not in a, uh… crusty way) multigrain bread? With some organic strawberries and cheese, dark chocolate (not nearly as delicious as milk, but whatever) and a sort-of healthy butter, this is practically a health food. Tons of antioxidants. Even some fiber. Obvious protein. And it’s not only mine. Hi! Thank you so much for your recipe! 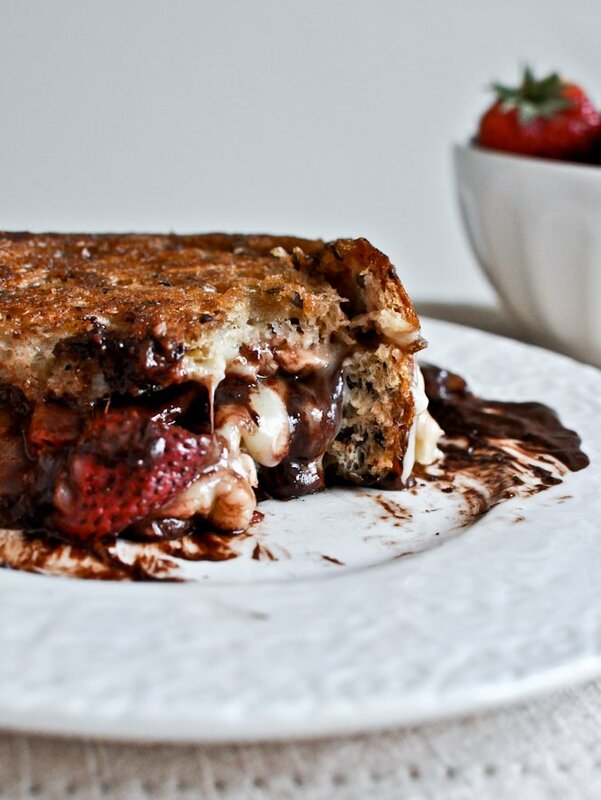 This is divine… I’ve made it three times but with nutella instead of dark chocolate. Today I made it again but I threw on some basil leaves… elevated to a whole new level. Amazing. Whoa! I’ve never heard of anyone who would eat cheese and chocolate together. Looks delicious though! 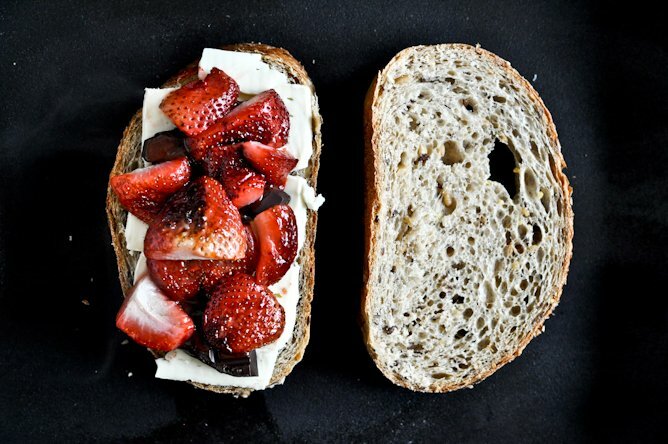 “roasted strawberry, brie + chocolate grilled cheeeeeeeese.” My wife will read it. Why don’t have button share on facebook ? This is really great post.I want to share.Please.My friend will like it. Did you ever hear Ween’s album Chocolate and Cheese? It’s almost as good as this sandwich!!! Keep up the good work. This looks amazing, will share on my blog today with direct link to this post. Have a great Sunday! This recipe look very interesting, I must give it a try.